"Its Christmas in Killarney . . ."
After staying at Ashford a few days, we headed for Killarney, which is a bit further south on the West Coast of the island. During this segment of our stay, I regularly burst into that old Bing Crosby song – you know, the one that goes, “It’s Christmas in Killarney, with all of the folks at home!” – just to ensure Kirk was well-entertained along the way. He appreciated the effort, I’m sure. Killarney is a quaint shopping town, but we did little more than purchase a few books in the one bookshop we could find on the main street. We spent the rest of our time on daytrips to the surrounding countryside, including stops at the breathtaking Cliffs of Moher (pronounced “more”), the famously craggy Burren, the tiny fishing village of Dingle on the Dingle Peninsula, and the serene Ring of Kerry drive, replete with streams, mountains, waterfalls, forests, and lots of sheep, cows, and churches! 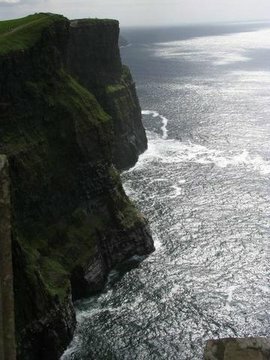 Here’s what you’ll miss if you don’t see the Cliffs of Moher on your next trip to Ireland: one of the most beautiful places in all of God’s green earth! In other words, don’t miss it. We stopped in amazement so many times while walking the long trail to its almost-end. Is it any wonder why? In Dingle, I took the liberty of photographing my very handsome and studious-looking new husband. Love that lanky form! There’s so much to see on the long Ring of Kerry drive, but here are a few of the snapshots. It is truly worth the couple of hours you’ll spend winding your way around its curvy peninsula.